The days have been filled with making gingerbread houses, eating way too much candy, shopping in Seattle, anticipating Miss G’s homecoming (tomorrow! ),watching It’s a Wonderful Life, drinking lots of peppermint coffee, watching out my office window as the kids filmed their Christmas special, The First Christmas; I especially enjoyed watching Mary go by on her donkey, and, of course, making food for parties. Here are a couple of easy, exotic dip recipes I tried out this holiday season for those parties from my fairly new cookbook, Turkey by Leanne Kitchen; smoky eggplant dip and muhamara with stuffed flat bread (it’s a scrumptious red pepper dip). The cookbook itself is beautiful- breathtaking photographs and easy to follow recipes. My tennis ladies loved the eggplant dip. 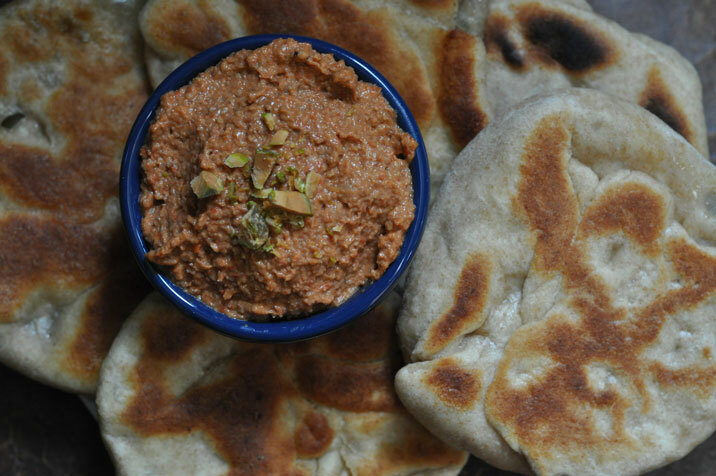 My favorite was muhamara which is a roasted red pepper dip; it you didn’t have time to make the flat bread, it goes perfectly with cut up pita bread or pita chips. There was one fairly exotic ingredient in the muhamara; pomegranate molasses, which if your grocery store doesn’t carry it you can always find online at amazon. Remember it needs 8 hours in the fridge to develop its flavor, so make it the night before. Char the red peppers, either by placing them directly on a low gas flame for about 10-15 minutes, turning frequently or, as I do, broil them, turning frequently, until they are blackened all over. Then place them in a closed paper bag or a bowl with a tea towel on top for a few minutes until cool enough to handle. The blackened skin should slide off easily and remove the stem and seeds. Do not RINSE! Put the red peppers in a food processor with the bread, garlic, walnuts, chile flakes, tomato paste, lemon juice, pomegranate molasses, sugar, cumin and olive oil and process until a coarse paste is formed. Season with salt and pepper and transfer to a bowl. Cover with plastic wrap pressed directly onto the surface of the dip and refrigerate for a least 8 hours for the flavor to develop. Serve the muhamara at room temperature with a little extra olive oil drizzled over and sprinkled with pistachios (optional) and warm flat bread or pita chips on the side. Combine 2/3 lukewarm water with sugar and sprinkle over the yeast. Let get foamy and then add another 1/3 cup lukewarm water and the olive oil. Combine the flours and the salt in a bowl, add to the yeast mixture, and stir to form a coarse dough. Turn out onto a lightly floured surface and knead for 7-8 minutes or until the dough is smooth and elastic. I used a kitchen aid for the mixing and kneading- on the 1 or 2 speed for 4 or 5 minutes. Cover with plastic wrap and set in a warm spot to rise for about an hour, or until doubled in size. 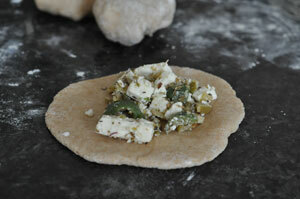 Meanwhile, combine the feta, olives, and oregano in a bowl. Punch down the dough and divide into 12 even sized pieces. (I did 24 to make them smaller) On a floured surface roll out the dough into a roughly 5-1/2 inch diameter circle. Evenly divide the filling between the rounds and use your fingers to bring up the edges and enclose the filling and form a ball. Place the ball, seam side down, on the floured surface and gently roll out to make an approximately 4 inch diameter circle. Cook the flat bread over low heat in a heavy frying pan coated with a little olive oil for about 3-4 minutes each side, or until a golden brown color. Serve warm with the muhamara. You need to char the eggplant all over. You can do this by holding it directly over a low gas flame if you have a gas stove or on a hot barbeque grill, turning frequently for about 20 minutes until the skin is blackened all over. You could probably use the broiler, too, turning frequently. I have tried the first two methods and the grill worked the best for me. When cool enough to handle, peel the blackened skin away, trim the stem off, and place in a colander to drain for about 20 minutes. In a large bowl mash the eggplant with a fork (this did not work well for me, so I used a food processor). Add the olive oil, garlic, lemon juice and yogurt and stir well to combine. Serve with lavash, any flat bread or pita chips. Hooray – – you’re back! I have so missed your posts Joan. Please oh please post the decadent pinwheel recipe you brought to the concert last night. I had way too many of them – – three in fact. But they were most certainly calorie worthy. Merry Christmas dear friend!